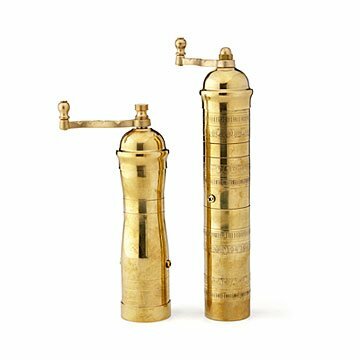 Inspired by antique Greek Army coffee mills, these sturdy brass beauties are modified to grind salt & pepper. A century ago, whenever the Greek army was on the march, they carried, guns, ammunition, and supplies—including hand-cranked brass coffee mills just like these. (Pity their American counterparts, who had to make do with instant.) Slightly tweaked to be more suited for salt and pepper, their adjustable steel grinding mechanisms can produce coarse to very fine grinds, seven times faster than ordinary salt and pepper mills. Though the originals were purely utilitarian, to our modern eyes, they're handsome enough to occupy your dinner party. Made in Greece. keep dry; this item will develop a natural patina but may be polished for a shinier look.